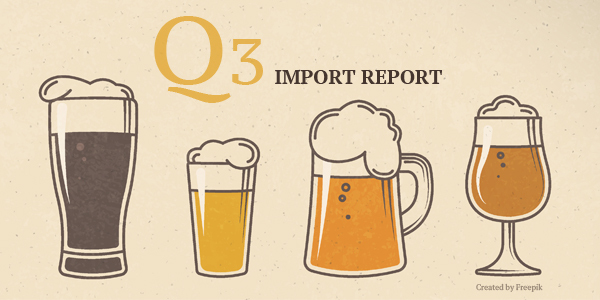 Our third quarter report sees imported beer continually gaining ground on the wings of European and Mexican imports. The category has steadily grown in both the calendar year to date and as compared to the last 52 weeks, with overall similar numbers across the board. Imports have now passed $4.5 billion in sales year to date and over $6.3 billion in the last year, with European and Mexican offerings comprising more than two-thirds of total sales. For the calendar year, this is an 8 percent increase over last year’s numbers, or an increase of more than $336 million in sales. These numbers are down less than a percent from Q2, a small shift which may be attributable to the in-between period between large drinking holidays for imports, and the Fourth of July surely skews towards domestic lagers. The advent of fall and Oktoberfest should make for a strong fourth quarter for stronger beers. Mexican beer continues to dominate the import category with more than two-thirds of total sales and double-digit growth hovering around 11 percent year-to-date. Once again, however, it is the Belgian category which has topped the charts for growth, up nearly 12 percent year-to-date. This bodes well for a very strong finish for Belgian and other European imports this Holiday season – when the weather and need for “gift beers” stir American interest in the richer, darker offerings from across the pond. As bonfires and feasts replace cookouts and ballgames, Mexican lager sales should slow a bit. Perhaps most promising for Belgian beer is that it is selling well throughout the year, demonstrating a more stable grasp of the marketplace rather than one reliant on seasonal spikes. This foothold should continue to grow as Belgian and other imported brands continue to perfect their methods for selling imported beer in America. The breakdown of the overall European beer category, which has seen mild growth year-to-date (1.7 percent) sees Holland chugging along at a steady clip, with stable growth of .7 percent, and accounting for around half of total European beer sales in America. Asia, Canada, Germany, and the U.K. all continue to see significant declines in sales and dollar share, fluctuating in severity. Sales from Canada and Germany, which comprise the largest relative chunks of the market, are down around 3 and 9 percent respectively. Asia, a comparatively small market is down 7 percent year-to-date while the U.K. is down a whopping 18.8 percent, a drop of over $9 million. This precipitous drop may indicate more of a shift in what the U.K. is bringing into America, rather than a complete loss of interest in its beer. The U.K., undergoing its own craft renaissance, may be exporting less volume overseas, but its offerings are likely more varied and of a higher quality. So, while the market is shrinking, it reflects a shift to quality over quantity. Last but not least, we’re seeing a nice jump in the Australasian category, up more than 4 percent year-to-date, with a dollar increase of more than $2 million year to date, bringing this category into contention amongst the mid-tier of import sales. This is a category to watch, as sales over the next few quarters should indicate whether this is more of a spike or a long-term gain of market share. Overall, our third quarter remains dominated by major European and Mexican players, with shifts in the lower tier skewing towards Australian beer, and an emphasis on quality over quantity from the U.K. With overall import growth steadily on the rise, a focus on quality will remain crucial, as import quality is one of the most consistent selling points over American craft and domestic beer. Those brewers which can adapt to modern American tastes by combining exciting new flavors with traditional European quality will rise to the top. IRI Worldwide is a market research firm which tracks category-wide sales trends of beer sold in numerous retail outlets and then produces a monthly report of its findings. These findings can be used to provide real-time insight into the ever-changing beer marketplace, both craft and macro. Here, we examined the most important changes in the world of imported beer over the second quarter of 2017. These findings can help you make more informed choices as a consumer, and can help commercial brewers adapt to the marketplace. Sometimes, it’s just fun to see what’s hot and what’s not. Here are a few things to keep in mind – these numbers are on a national level, and may not represent specific states accurately. The numbers also do not represent beer sold on-premise, which would likely skew the numbers in the favor of smaller brewers, who are far more likely to see profits from onsite sales. They track sales of packaged beer only, from a few different sources, including convenience stores (think gas stations), a general “food” category (grocery stores, etc. ), and a combined multi-outlet and convenience (MULC) store category (a combination of grocery, drug, Wal-Marts/Sam’s Clubs, dollar stores and military stores, among others). We focused on the MULC category. While not all-encompassing, it’s a great, well-rounded resource. It is also worth noting that these numbers do not reflect differences, perceived or otherwise, in craft and macro beer. Were these segments broken down, you’d see more dollar share for countries like Belgium, Germany and the U.K., and less for Mexico, which rides on the heels of Corona, Modelo and Dos Equis.